Drawing on decades of research and teaching, Capron and Mitchell find that a firm’s aptitude for determining the best resource pathways for growth has a defining impact on its success. They’ve come up with a helpful framework, reflecting practices of a variety of successful global organizations, to determine which path is best for yours. Many articles and books have been written about the high failure rate of acquisitions, focusing on the challenges of integrating newly acquired companies and functions. In Build, Borrow or Buy, however, INSEAD professor Laurence Capron and co-author Will Mitchell of the University of Toronto’s Rotman School of Management ask a more fundamental question: Is buying a company the best choice for acquiring the resources you need? It may seem like an obvious question, but according to Capron and Mitchell, many companies don’t take the time to consider the different options for acquiring the resources they need to keep growing and competing. Instead, they often default to their option of choice based on what they’ve done successfully in the past. Build by developing the resources in-house. Borrow via contract by signing a focused deal for the resources from an external source. Borrow via alliance by acquiring the resources from an external source through a close ongoing relationship. Buy. Acquire the resources by acquiring the company or functional unit. In this well-organized book, Capron and Mitchell devote one chapter each to the four options listed above. In each chapter, they explore the one deciding factor that determines whether or not the resource-acquiring option in question is the right one for your company. When deciding whether to build the resources in-house, the defining factor according to the authors is internal resource relevance — that is, whether the resources that you already possess in-house are relevant to the strategy that you are seeking to pursue. Determining this issue requires looking at two areas: knowledge fit and organizational fit. First, does your company have the knowledge in house required to build the resources? At the dawn of the digital age, the authors write, print media companies made the mistake of believing that they had the knowledge to transition to digital media. As it turned out, digital media requires a different set of skills and tools. In addition, write the authors, companies must determine if they have the right organization for developing resources internally. The authors describe the same process for the other three options for filling the strategic resource gap of your company: Identify the fundamental issue, then answer the knowledge question and the governance question that will help you assess whether the option is best for your company. 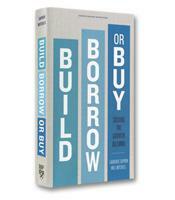 For the borrow via contract strategy, the fundamental issue is resource tradability. Tradability, the authors explain, "means that you can clearly define what you need and determine that a contract will protect the value of each partner’s resources." Thus, the knowledge question would be: Can you define the targeted resources clearly? For governance, you need to ask: Can you protect the resources’ value? Answering yes to both questions points to a contract strategy as your best option. Answering no to both questions should eliminate this strategy. Any mix of yes or no makes the contract option more feasible but complicated. The deciding factor for the borrow via alliance strategy is the desired closeness with the resource partner, which is analyzed through two questions. The first is a knowledge question: How focused is the scope of the collaboration? The second is a governance question: Are your goals compatible with your partners’ goals? Finally, the deciding factor for the buy option is the feasibility of integrating the target firm, which is answered through two questions: Is there a clear integration map, and can you keep employees motivated? In sum, the Resource Pathways Framework developed by Capron and Mitchell is a decision tree that moves the strategist logically and systematically through the four strategies. A few well-designed charts further clarify this practical and comprehensive map to future success.